You are here: Home » Superman? What happened? This is the story of, one of, the greatest films never made. The Death of “Superman Lives”; What Happened? is the story of that film. From an a-list director, star and written by uber comic geek Kevin Smith. Warner Brothers were onto a winner with this one. Or so everyone thought until the plug was pulled at the last minute. Just before principle photography started! The trailer does make the film, if it was made, the most epic film of all time. Tim Burton had just finished Batman Returns and then this project appeared. If it had happened, would we have had Mars Attacks? The Death of Superman Lives; What Happened? delves into one of Hollywood’s most enthralling ‘what could have been’ stories. In 1996, Warner Brothers engaged Kevin Smith to write the screenplay (‘Superman Lives’). 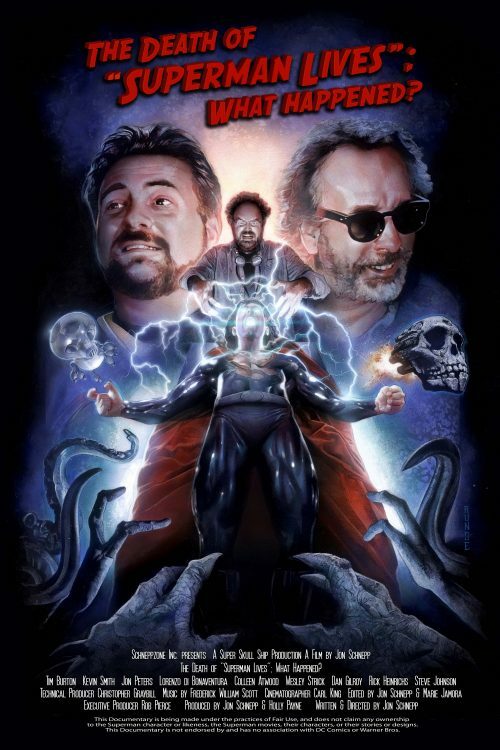 Director Tim Burton assembled an elite group of artists to work on Superman Lives, including Nicolas Cage as Superman. Warner Brothers scrapped the project shortly before principal photography began. The Death of “Superman Lives”; What Happened? screens at MCM Comic Con at ExCel London this Friday and Saturday 22nd & 23rd May and on VOD from 9th July.